We have been staying in Ljubljana for 4 months. First 3 months was quite hectic with some projects;after that, we tried to make the weekends more relaxed by exploring Slovenia and even surrounding countries a bit. 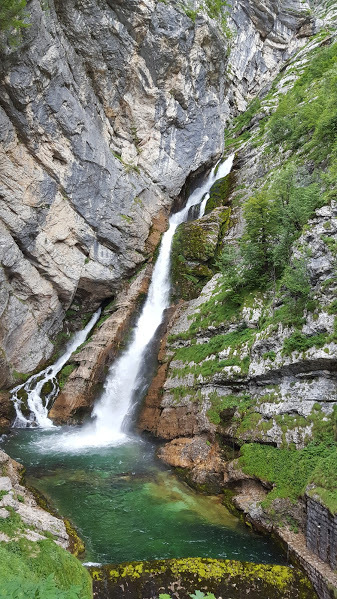 I saw some beautiful photos from friend’s fb posting of hiking in Triglav national park and decided to give it a go. As Ljubljana is really famous for unexpected rainfall, I was checking the weather forecast and plan ahead this time (doesn’t really like me, a notorious last-min person). Booked one good hotel – Bohinj Eco Hotel. Finally Saturday came. We had breakfast at home, then started making our way to the hotel. Since with the little one, too tight itinerary was not favored; after consulting hotel staff, we finally agreed to go to see one waterfall. Zoey fell asleep during 20 minutes drive, so we ate some hot dog then waited for her to wake up. After 1 hour, little angel got up, we didn’t give her some real food, but the cheese stand in the parking lot attracted our attention. We tried a bit and bought half a kilo of this local hand-made cheese, zoey ate a lot, i mean a lot since she was hungry. May I enjoy in this drink! There was a tap outside the gate – mineral water? I did collect some, fed Zoey as well as ourselves. After getting down, we drove back to hotel. Then I took her to the Aquapark connected with hotel. She didn’t know how to swim yet, just walked around the kid’s pool for about half an hour. After a quick bath, we enjoyed the hotel dinner. As a special occasion, I didn’t stop her to eat a few desserts. She went to sleep about 9:30pm. Everything seemed normal by then. I shared the same bed with her, her daddy was sleeping on another bed. Morning, at about just after 4am, I felt her sit up and had a big cough, then I saw something dark on the bed sheet — I have short sight, could not see clearly, but worried, so I just grabbed it with my bare hand, it’s vomit. Gosh. Ok, here we go. I woke up her dad, then we cleaned, gave her some water. Then she vomited again. The cycle went on for 3 hours. At 7am, I called hotel reception, hoping they had some medication. They don’t, but the girl advised me that a clinic just 50 meters from hotel with doctor on duty from 8am. So we waited till 8am and rushed to the clinic. The doctor looked a bit hippy to me and didn’t really say anything that we didn’t know before. But just to get the reassurance, we spent 40 Euros. 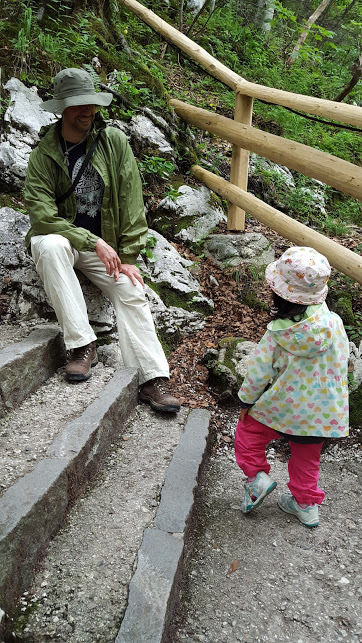 We abandoned the original plan to visit The Vintgar gorge (See my post on visiting the Vintgar Gorge on a separate trip here) and drove home. all pharmacy was closed on Sunday in Ljubljana, we didn’t really give the poor little girl any medication. Just some dry bread and some chamomile tea. Overnight, she got a bit fever, I used more physical way to reduce her temperature – cold towel etc. The next day, I stayed at home with her, still mild diet without any dairy food. She got sort of diarrhea as well, I tried not to panic, just observe that she was hydrated enough, happy and didn’t make too much fuss. On Tuesday, she went back to the kindergarten. From then on, she was on the way to recover. Maybe not to inject too many excitement for your kids in one day, which probably will lead to some sort of dysfunction, one way or the other.